Prime Minister of Japan Yoshihiko Noda joined the Prime Minister of the Cook Islands Hon. Henry Puna as chair of the Sixth Pacific Islands Leaders Meeting (PALM 6), held in Okinawa in May. "Our future is a tapestry of forest, village and sea" is the theme of the Japan Pavilion at Expo 2012. 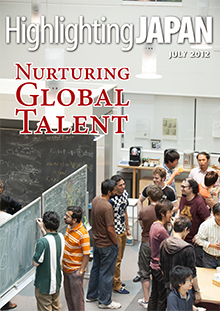 In this month's Cover Story, we report on some of the programs geared to nurturing the human resources needed for international society. A number of initiatives across Japan are helping to foster the sort of human resources needed for an increasingly globalized society. At the Kavli Institute for the Physics and Mathematics of the Universe, for example, researchers from around the world are together investigating the mysteries of dark matter. The International School of Asia, Karuizawa (ISAK) will become the first international boarding school in Japan after it received official government approval for its establishment. The Japan Exchange and Teaching Programme (JET Programme) is one of the world's largest government-linked international exchange programs. Kyoto Seika University is drawing students from around the world to its manga drawing courses. Judo coach and Japan Overseas Cooperation Volunteers (JOCV) member Asami Togo will accompany El Salvadoran judoka Carlos Figueroa to the London Olympics. Angelica Tabora was one of just three foreign nurses to pass Japan's tough national nursing examination this year. The Japanese government is pursuing policies to strengthen a human network linking Japan and foreign countries. A language-teaching program at Gunma University is one example. Convenience store chain Lawson is actively recruiting foreign employees in response to the rapid progress in globalization and to the firm's own growing presence overseas. Learn about Japan's forests and answer our quiz! Patients suffering from severe heart disease once had no choice but to rely on heart transplants or an artificial heart, but now they can return to good health using a new regenerative therapy developed in Japan. Takashi Sasaki reports. Tamanoyu in the hot spring resort of Yufuin is renowned for its outstanding hospitality, beautiful gardens, and exquisite food. Izumi Kuwano, president of Tamanoyu and chairperson of the Yufuin-Onsen Tourism Association, explains her approach to the hospitality business. Stéphane Danton from France has established a unique business in Tokyo selling flavored green teas. Workers at Saiei Orimono in Kawamata, Fukushima Prefecture, have rallied together and continue to produce some of the world's highest-quality silk, despite the tough times.